Luggage sets are the perfect choice for anyone that likes to travel. They are practical, economical and matching luggage looks good too. This article will help you find the perfect luggage set for your travel needs. There are many reasons for buying luggage set. One of them is practicality. Owning the right luggage set for your travel needs means you always have the right piece of luggage at hand, whatever the occasion. You do not have to pack less because your luggage piece is too small or dash out to buy or borrow bigger bag. Some travelers prefer to travel with matching luggage pieces. Luggage sets make a statement about the owner. Matching luggage pieces indicates you like to travel and do so regularly. Maybe the best reason is though the price. Buying luggage set is usually substantially cheaper than buying the individual luggage pieces separately. Buying luggage set is not that different from buying single piece of luggage. You need to have similar things in mind, like the quality and durability (material, wheeling system, handles), the weight, size, style, brand and price you are willing to pay. On the other hand, when we buy one piece of luggage we usually buy it with some specific purpose in mind. For example, we are likely to buy suitcase with longer vacations in mind, while we buy carry-on bags with shorter trips in mind. When we buy luggage set, we are buying luggage with a mixture of future trips in mind. So when buying luggage sets, we should start by defining our overall travel expectations for the future. If you only do short trips, then good range of carry-on bags would be logical choice, and even spinner luggage set. If you mainly do long family vacations, then combination of larger and smaller luggage pieces would be more suitable. What kind of travelling am I likely to be doing in the future? What type of luggage do I prefer, i.e. wheeled bags, spinners, backpacks, etc.? How many luggage pieces do I need? What combinations do I like, e.g. one suitcase and two different size carry-on bags or three different size suitcases, one carry-on and one duffel bag? What size would I like each luggage piece to be? What styles do I like, e.g. fashionable, trendy, conservative, practical, multifunctional, and so on? Where am I going to store my luggage set when not in use, should I go for nested set (when all the pieces fit neatly inside the largest piece so they can be stored as one piece)? If you know the answer to those questions then you will have no problem finding the right luggage set for you and your travel needs. Some frequent travelers do mainly one type of trips, e.g. short business trips. Most however do all kind of trips, e.g. go on short business trips, take long family vacations, enjoy regular city breaks, like golf vacations, etc. Those frequent travelers should look for big and versatile luggage set, i.e. with different luggage types (suitcase, carry-on, duffel bag, laptop case) and even with different sizes of some of the types. Frequent travelers should always go for high quality luggage sets, as they will be using their set more than most. Good wheeling system and easy-grip handle are vital, as well as quality lightweight material. Well-organized business luggage set will help you to stay productive during your business trip. Business travelers usually prefer carry-on bags whenever possible. Most business people today also travel with laptop and other business gadgets. The best business luggage set offers good combination of both, i.e. luggage pieces for personal belongings as well as for the business equipment. The best luggage for business travelers is lightweight, easy to maneuver, versatile, well organized and durable. The personal belonging luggage pieces can be suitcase, carry-on bag or garment carrier. It can be any one of those, all, or combination of different sizes, i.e. depending on the purpose and duration of the business trips. If you are frequently travelling with business suits, then you want something that minimizes the wrinkling, as garment carrier bag does. The luggage for the business equipments needs to protect the necessary and expensive business equipments, so good internal padding is vital. Families, and especially those with young or many children, do not travel light. Families therefore need varied combination of luggage pieces, mainly suitcases and carry-on bags in different sizes. Durability, versatility, and flexibility are the keywords where family luggage is concerned. This is why luggage sets are excellent choice for families. Family luggage set offers different packing options to fit different travel needs and situations, allowing the whole family to travel together. While individual family members will be able to pick the right luggage piece whenever travelling on his/her own. 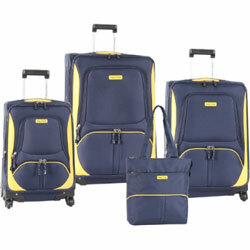 There are luggage sets available that cater for various individual travel needs. For example, there are special travel sets for golfers. Golf luggage set usually includes golf club travel bag as well as separate shoe bag and duffel bag for personal belongings. It is highly recommended to be able to strap the duffel bag on top of the golf club bag for easier transportation. Skiing luggage sets are similar, i.e. include bag for the skis, separate boot bag, and small bag for personal belongings. There are so many and versatile luggage sets available enabling every traveler can find the perfect luggage set for his/her travel needs. Just answer the questions in the beginning of the article and you will have no problem finding the right luggage set for you and your travel needs. Bear in mind that it might be worth spending more for the perfect luggage set, as you do not want to be buying luggage sets on regular basis.